I’m hanging out in my happiest place on earth. Seattle, well more accurately the Pikes Place Market. Sighh… Oh I wish I could live in the market. I’ll have to settle for being an hour’s flight away. Jesse and I also stopped at the Almond Roca Factory in Tacoma. The thing is ancient, and sadly there were no tours. They wouldn’t let us in for fear of slipping on buttery floors. I thought it sounded like fun personally. So I grabbed a 2 pound bag of Mocha Roca Mishaps to give away instead. I don’t know what you’re going to do with a two pound bag, but I suggest a big party. Leave a comment about what the heck you’d do with a giant bag of Mocha Roca Mishaps and a way to contact you, and I’ll have the number generator do it’s magic Wednesday morning. The soup is amazing and now I’m completely obsessed with roasted carrots! So rich and garlicky and yummy. Don’t be tempted to add extra Parmesan. It’s there for the final umami flavor, but you don’t want this to end up as cheese soup or the vegetables will get lost. 1. Preheat the oven to 4oo degrees. Line a rimmed baking sheet with foil. 2. Peel as much of the skin off the outside the garlic clove as you can. Then chop the end off so the cloves are exposed. Place the head of garlic on a piece of foil big enough to wrap the garlic in. Coat well with olive oil and sprinkle with salt & pepper. Wrap the garlic in the foil and place in the center of the baking sheet. 3. Peel and chop the carrots into about 1 inch pieces. Peel and cut the onion into chunks. Place on the baking sheet and coat well with olive oil, 1 teaspoon sea salt, lots of fresh cracked pepper, and 1 teaspoon dried thyme. Place in the oven and bake until the carrots can be pierced easily with a fork. About 40 to 50 minutes. Toss the vegetables half way through cooking time. 4. In a food processor, puree the cooked vegetables (careful squeezing out the hot garlic cloves) with Parmigiano Reggiano and drizzle in the heavy cream while the machine is on. 5. Place the mixture and the broth into a pot and cook over medium heat until warmed through stirring often. Season to taste with more salt and pepper if desired. The soup looks great! I've been reading a lot about carrot soup lately and I can't wait to try it. You must be on a carrot kick. This soup looks absolutely divine. Lucky you to be at Pike's Place with all of that fresh local delicious food! What would I do with the Mocha Roca? I'd eat 'em all! Wow, the soup looks beautiful. A great healthy soup. What would I do with 2 lbs of Almond Mocha Rocas?.... I put them in a big bowl, shake-up some cocktails and invite a few friends. I'll have to trying roasting the carrots next time I make carrot soup - sounds like a tasty improvement over mine. Pike's Place market is such a great market. and Almond roca bits? oooh I think I might bake some into a pound cake. Lately I've been thinking how to eat carrots (besides raw). Here is an idea! For your giveaway, I would use it in a Chocolate Bark recipe. p.s. Take a picture of wearing the Baking is my Zen t-shirt & upload it on flickr...(just a suggestion). Tonight I made the "pasta version" of this soup (grin). It turned out divine (even if I did substitute fresh Romano for Parmesan). Oh, and I owe you one teaspoon of Thyme...when you get home you'll find your Thyme supply almost out. Loving all these carrot recipes that are popping up over here!! And one day maybe I will make it to the West Coast... maybe! And as for Mocha Roca?! My bday is in a little more than a week... forget a bday cake- We'll eat Roca!!! your soup looks delish~ almond roca... was my grandmothers favorite, such memories 50 years ago! ciao!!! bellissima e invitante!!! complimenti!!!baci! Laura, this is a much better recipe than what I read in the mag yesterday, and one I will definately serve to our guests at the next lunch. What would you reccommend as a side sandwich? I was thinking egg salad? or maybe chicken salad? as for the Almond Roca, its been a favorite of mine for 30 years. What would I do with it? I would enjoy it one bite at a time, the entire thing! yummmmm!!! 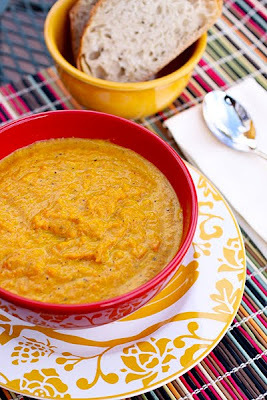 Oooh the carrot soup looks divine, i got to try roasting my carrots the next time I am making carrot soup! Almond Roca? I would make some muffins and pound cake..hmm..yummy! Orange is such an enticing soup colour isn't it? (I think like a mum). Healthy too. Soup sounds really great can`t wait to try it out, thanks!!! i would most likely try to make an almond roca Taj Mahal. I would eat it....all by my lonesome! ;) I know *just* the place I can stash it for myself. Is that bad?!?! I love carrot soup and just happen to have a huge bag waiting for its life's purpose. Thanks for helping with that quest! Hi Laura! I just made a soup over the weekend with some carrot but it was more of a chicken/veggie soup. This one looks great! I would make some kind of dessert spread and add those in. Yum! What the heck would I do with a giant bag of Mocha Roca Mishaps? Well, probably eat them right out of the bag then; try them in a cookie or maybe in a cheesecake. The possibilities are endless! This soup sounds wonderful. I will have to give it a try. My carrots are the only veggie that has survived in my organic garden with this Texas winter spell. I've never had carrot soup. It seems easy though. The garlic is what really makes me want it. I need to get more into roasting vegetables. I always say I will, but I never do. I love how pretty this soup is, too. As for the Mocha Roca, I've never heard of them before. I am having a party in May though so there's a thought. I would use the Almond Rocca as decoy for my kids. While they are distracted with the Almond Rocca they wouldn't be eating my roasted carrots and I could make the soup. Laura, We're actually leaving for a soup fundraiser in a few minutes, but it's doubtful they'll have anything as yummy as this! I think I would ant to bathe in rocca, because thats what I dream of doing with anything so delicious that I encounter. I cant wait to make this soup with all my homegrown garlic! That soup sounds fabulous, and will help used up the 15 lbs. of carrots I have in the fridge (I'm a juicer). Pike's Market is awesome! I've lived in Seattle for 10 years and still don't think I've been there enough. i've got a surplus of carrots at the moment and was looking for a yummy recipe--this should fit the bill, thanks! For your mocha rocha, I suggest you write a song about it, it already rhymes! kidding, fudge with mocha rocha sounds like a winner, and I'd sell it as a fundraiser for the leukemia and lymphoma society. Mocha roca? I'd eat 'em. Share if I must. Yum! Alright,confession time. The last carrot soup I ried was a dismal failure... but this looks pretty darned good. Might even inspire me to give it another try. As far as that Almond Roca goes...wow. I think I'd have to make Almond Roca ice cream. In addition to eating them straight-up, of course! to be honest I've never even heard of Mocha Roca but it sure would be fun to play with! I read about the whole head of garlic and I was sold! Gather a group of small children, and feed them like ducks in a pond? I wouldn't, but I would *want* to! Sounds fabulous - healthy too! I would be in so much trouble with 2 pounds of almond roca sitting around. Oi! I can taste it now! Yummmmmmmm. I was planning to try the roasted carrot pasta this weekend, but now I'm torn! In my experience, roasting makes everything better, so I can understand why you're obsessed 8D. The soup looks and tastes incredible! Your photos inspire me to take that extra time & trouble for hubby and me. The Roca would be saved for a special Easter treat, when my son & granddaughter come for a notnearlyoftenenough visit to Omi's house! This was delicious, and super easy! I added a bit more cream (it seemed a little thin at first) and also put a dollop of (store-bought/Trader Joe's) raita sauce on top. Yum! Yay! Glad you liked in Jennifer. Thank-you! I've made this soup twice now this week...It's fantastic! Thanks for sharing a great recipe!! The soup looks divine and I will be making it, perhaps this weekend~ As for the almond roca - I was just given a 2 lb bag of this delicious treat from a friend as a thank you for the dinners he enjoys at my house. I believe I will include them in a warm and chocolately brownie recipe and crush and sprinkle them atop a wonderful (fat free - you've got to use it when you can) double churned ice cream!! Yummie.....I'm in heaven just thinking about it.